Many women have found it difficult to find a carry solution that is comfortable as well as being practical. There are several feminine-styled holsters on the market but many of them are just not practical or even comfortable for extended use. 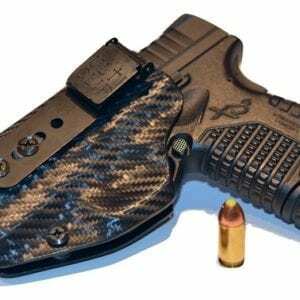 The holster manufacturers design team includes experienced female shooters that understand exactly what is required for a comfortable women’s concealment holster. Our MINI Trump Card and Trump Card Subcompact-EXT concealment holsters were both designed by a female shooter/designer. This is a garment and is not returnable.